Several months back I had been asking about recommendations for fantasy books. I don’t remember what exactly I’ve been asking for and the reasons why people picked it, but The Tombs of Atuan by Ursula Le Guin came up a lot. I don’t even remember the other books recommended at my querry back then. Somehow I only got around to reading it now. I really didn’t know anything about it or anything else written by Le Guin but at only about 150 pages it’s a pretty short book and seemed liked a good opportunity to broaden my horizon and knowledge of classic writers. I generally turn pages at a quite leisurely pace and still took only about 4 hours to read it. The Tombs of Atuan appears to be set in the world of Earthsea, which is a name I heard about before and that appears twice in the book, but otherwise it appears to be entirely a stand alone story. It’s about a young woman who becomes high priestesses at the temple complex at the very same Tombs of Atuan, being believed to be the reincarnation of the same high priestess who held the position since the very creation of the site by the other priestesses. Which brings me to me first problem with the book: The plot. In the first half of the book, nothing happens. In the second half, very little. I’ve heard Brandon Sanderson once saying that generally you want to tell the audience what the story is about very quickly. As a writer you make a promise to the readers what kind of story they can expect to get and what themes it will be about. The Tombs of Atuan doesn’t have anything like that. It simply gives you some characters and some scenes, but no indication at all why you should care about any of this is and how it might become important later on. This drags on almost to the halfway point of the book until finally something actually happens. Some little potential disturbance of the status quo. But even from that point on there is no actual goal anyone is trying to accomplish, and with a short exception of just a few pages towards the end, not even a conflict of any kind. But not all good books need to be about plot. There are many amazing stories in which the plot really barely matters at all. But these stories have other areas in which they shine. Worldbuilding can be one of these things, but The Tombs of Atuan has almost none. Almost the entire book takes place in the same temple complex at the tombs, with all the scenes happening in only four locations. The temple is build next to an ancient religious site in some kind of desert where the protagonist has been for as long as she can remember. We don’t learn anything about the desert, nor anything that lies beyond the desert. We’re not really being told anything about the geography, the culture, or the history of this world. All we’re ever told is that some of the current rulers are referred to as god kings and that this has not always been the case. It’s just this one temple that also is very much lacking in any actual history and even though all but one character in the story are priests there is never a single word about their religion. The underground tunnels below the temple are somewhat interesting at first, but unfortunately the entire book is very sparse on visual descriptions or mentioning sensations of any kind. And the protagonist is going in and out of the tunnels so frequently that they pretty soon become very mundane and lose the potential mystery and spookiness they might have had. 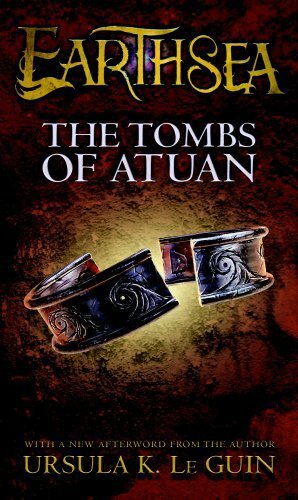 And why is it called the Tombs of Atuan? It doesn’t seem to be any kind of burrial site at all. And I think Atuan is just the name of the land in which it is located. The title sounded curious, but it’s really “The Tunnels under the Desert”, which doesn’t sound not nearly as snappy. Both plot and setting feel quite lacking, but in these two regards my feelings for the story are mostly indifferent. Where the book starts to have a real problem is with the characters. For the first half of the book the protagonist is slowly somewhat developed as we get several scenes of her being brought to the temple, trained, and eventually taking on more and more responsibilities of being the high priestesses as she grows up. And she did start to somewhat grow on me as she became more strong willed and fierce, especially in her relationship to the other two old senior priestesses. Once the established order gets a teeny tiny bit desturbed in the middle of the book, though there’s still not really any plot starting to become visible, there seems to be some attempts to make the story about a crisis of faith. But it just doesn’t work at all, because at no point is there any mention of what the characters might believe in. There’s occasional rituals, but they seem to serve no purpose and we are never told anything about the ideology or dogma of the priestesses. There’s just a vague feeling of doubt and unease. But doubt of what? Why is the altar a giant empty throne? What are the Namless Ones to whom the site is dedicated? What’s the role of the Twin Gods? Having no name or being twins is not a religion. It’s just empty words. Even though the protagonist did start to grow on me, once things start to happen, she immediately falls apart, becoming highly insecure and unable to deal with the situation. And all because of the arrival of a man! She doesn’t instantly fall in love with him, but you still have a story in which nothing happens the entire time until a man arrives in a place inhabited only by women and eunuchs. The book is 45 years old and I understand that we now have very different expecations of a fantasy story than back then, and also take objection to things people may not have thought anything about. But once things start to actually get tough, the “heroine” immediately becomes very winy, helpless, and frankly annoying and has to be figuratively dragged along by the male character to not lie down and die in despair. At first it appears that she is under the influence of some dark supernatural force that tries to errode her will and that of the man as they start to become a nuisance. But once they are free of that influence, she still goes on like that. For some reason the big showdown of the story happens about four fifths into the book. But it doesn’t end and you basically get a terribly overlong epilogue that takes up the entire final fifth. And in a way, the protagonist only gets worse from there on. After having escaped from danger with the man he promises her he will bring her to a safe place but then continue on his way. And then she apparently falls in love with him completely out of the blue. She gets even more moody and dramatic than before and at one point takes a dagger in what seems to be an attempt to kill him but can’t go through with it. And a while later instead decides that he just should drop her off in the wilds so the elements and wild animals can kill her. And the whole time she needs that man to tell her that she’s wrong and that it’s not so bad, and that she’s a wonderful person and did so great, and blah blah blah. Lack of plot and weak worldbuilding I can excuse. But the characters are really quite bad. And there’s only really five of them. None of which are in any way interesting or likeable. But a young woman being super whiny and dramatic and needing a man to help her live is just terrible. And this from one of the few great female fantasy writers of the 20th century. To make it all somewhat worse, I also thought the writing felt very bland. Nothing evocative, clever, or snappy about it. So the question of “Yay or Nay?” really only becomes a formality.